Welcome to August and welcome to another edition of In-Process! First, thanks to everyone who has provided feedback about the new sounds in recent “Next” builds. The proposed new sounds were for starting and exiting NVDA, and going into focus and browse modes. There was a very mixed reaction to the proposed change. Some liked the new sounds. Some liked the idea of new sounds, but not the ones chosen, and others preferred to leave things as they were. For now, the best option seems to be to keep using the previous sounds while we look at other options. One thing that is clear, is that there is no one size fits all solution, including the current sounds. We are investigating ways of making it easier to create and distribute sound packs. That work won’t happen immediately so the sounds in 2017.3 will be the same as in 2017.2. There won’t be anything new sound-wise for a few releases, but we wanted to keep you up to date on where it was at. Another change, not as noticeable to many users, and hopefully not as contentious is an updated NVDA icon. The current dark grey shaded icon has been in use for nearly 10 years. It was first created for Windows XP, which had a light grey system tray which showed up the dark grey logo very well. Recent versions of Windows have moved towards a darker system tray. This provides very little contrast with the existing NVDA icon. 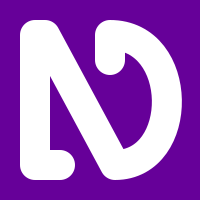 The updated icon features the same logo in a flat white, on a solid purple background. This ensures it will be visible on any colour background and uses the purple from the NV Access logo. The new logo is available in the latest Next and Master builds. For those wondering, the NVDA logo is a stylised blend of the letters NVDA. It has a vertical line on the left with a little hook at the bottom. Then from the top, a straight diagonal line comes down to the right. Next, a line curves in a semi-circle out to the right then back up to the top, and finally, there is a little hook down to finish. All three lines form an N. The vertical and diagonal lines make the letter A (without the cross bar). The diagonal and curved lines form a V, and the curve is the right part of the D.
In other news, work continues apace on ARIA 1.1. Grids are now incubating and should be in master later this week. Windows 10 OCR has been very well received by beta testers. For users of Windows 10, NVDA 2017.3 will have a built in OCR which works the same as the OCR add-on. This is available in Windows 10 only because it uses an OCR functionality which Microsoft has included in Windows 10. Users of earlier versions of Windows can still use the OCR add-on, which provides similar functionality. Both features work by looking for text in an image. Navigate to a graphic such as a meme on a web page, or an untagged PDF. Next, press NVDA+r to process the image. Any text found will then be available with the regular navigation keys. Mick is visiting Microsoft next week with other AT vendors. This is a great opportunity to share issues which have arisen for all screen reader users. We will all work together to improve the experience for everyone in Windows and Office. That’s about all for this time around. For those anxiously awaiting more news on when 2017.3 will be out, you’ll be pleased to know it’s on its way. The code freeze is this week, so translators have time to get their work up to date. So, when the next In-Process comes out in about a fortnight, we will be putting the final touches on NVDA 2017.3RC1!